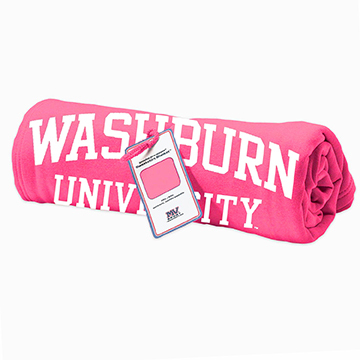 Cozy and comfy, the classic Washburn blanket is made from the same soft fleece as your favorite sweatshirt. Big enough to snuggle in at 54" X 84 " of WU warmth. Machine washable. 80 cotton / 20 polyester. 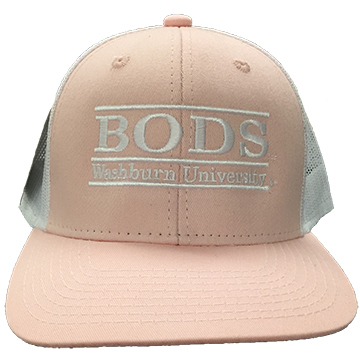 Flatbrim trucker hat features Washburn University Bods bars graphic. 100 Poly. Made in Vietnam. One size fits most. 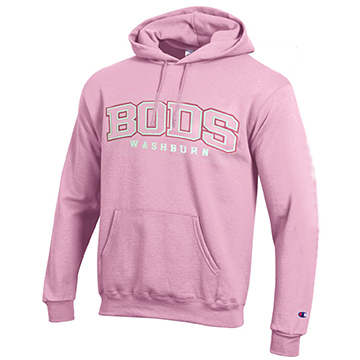 Light pink hooded sweatshirt features large, embroidered, BODS logo in a darker pink and white thread, and a smaller Washburn embroidered logo in white. Also features front kangaroo pockets. 50/50 Cotton/Polyester. Made in Honduras. Please select option for Hoodie - Pink Bods Outline. Sweatshirt version of the Pink Bods Outline hoodie.  Light pink crew neck sweatshirt features large, embroidered, BODS logo in a darker pink and white, and a smaller Washburn embroidered logo in white. 50/50 Cotton/Polyester. Made in Honduras. 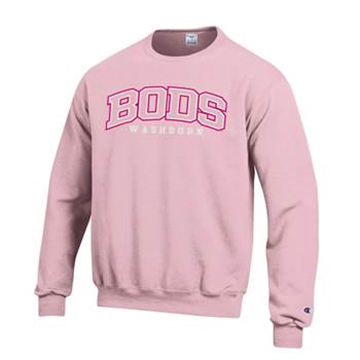 Please select option for Sweatshirt - Pink Crew Bods Outline. 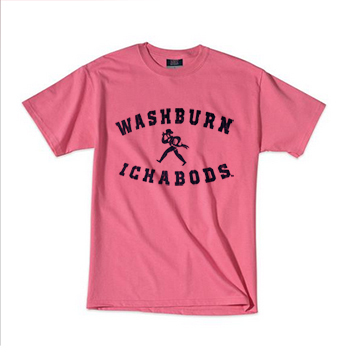 Classic crew neck tee features Ichabods Arch print and Ichabods graphic. Preshrunk 100% Cotton. Made in Honduras. For lilac, select "purple." Please select option for Tee - Ichabods with Mascot. 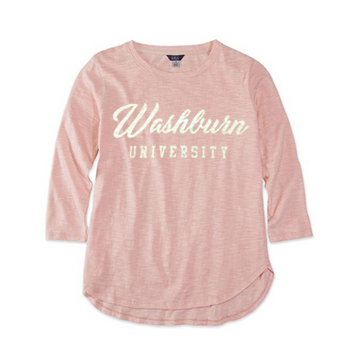 Ladies rose style long sleeve tee features Washburn University script lettering graphic. Made in Pakistan. Please select option for Tee - Ladies LS Washburn University Script. 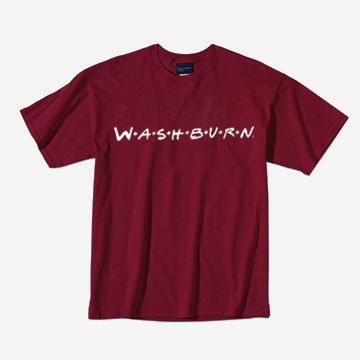 Crew neck tee in navy or maroon purple features Washburn logo in the style of the 90's Classic Sitcom Friends. 100% Cotton. Made in Dominican Republic. Please select option for Tee - Washburn Friends.